The price of this item includes a $3 bottle deposit. Next time you order milk choose the "I have a bottle to return" listing and leave your empty bottle in the bag at your pick up location. Q: I work at a grocery store and a customer was looking for raw milk, straight from the cow. Do you carry this? A: Hello and thank you for your questions. Unfortunately we do not carry raw milk. It is illegal to sell raw milk and the penalties for doing so are very high. All milk must be pasteurized in order to legally sell it. 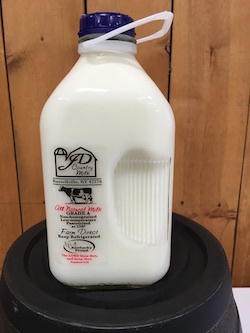 The JD milk is low temperature pasteurized which is as close to raw milk as we can get. I hope this helps!